Glenn Greenwald has been championing Edward Snowden and has reported that the Email service used by Snowden has shut itself down, warning against using US-based companies: ‘Google, Facebook, Microsoft, Yahoo, Apple, and the rest of our internet titans. He askes why have these companies rolled-over and are not fighting for our interests the same way. The front page of Lavabit announces to its users its decision to shut down rather than comply with ongoing US surveillance orders. Lavabit is a Texas-based encrypted email service that was revealed to have been used by Snowden. 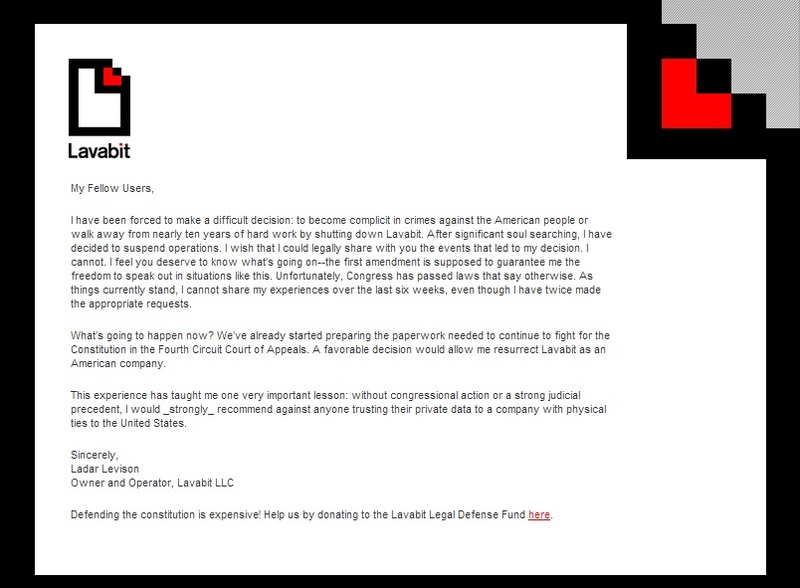 Lavabit it was shutting down in order to avoid complying with what it perceives as unjust secret US court orders to provide government access to its users’ content. “After significant soul searching, I have decided to suspend operations,” the company’s founder, Ladar Levinson, wrote in a statement. Lavabit was probably served with federal court orders demanding passwords and future ongoing monitoring of all emails through their server. Lavabit shut itself down to avoid compliance while it appeals to the Fourth Circuit. Lavabit has also been hit with a gag-order. A gag-order is issued by a court and you will be thrown in jail if you talk about the subject they are denying you. In my own case, they put a gag-order on all documents stating I could not reveal to the public what the banks were doing for the rest of my life. Anything I want to release HSBC has to approve until I die. 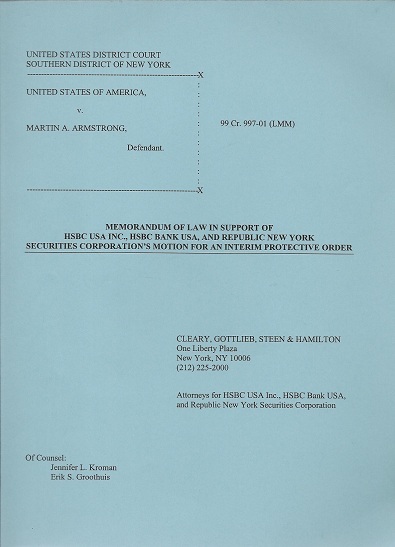 I was also not allowed to provide any evidence or assistance to clients who were suing HSBC. So much for freedom of speech, seeking the truth or helping alleged victims. They use gag-orders to protect favored sons like the bankers and illegal government operations. So Lavabit cannot come out and even state freely what the government wants them to do. The only choice is to shut down the company. In my own case, they demanded the source code to all our models or they would fire the entire 240 member staff. I had no choice but to shut the company or they would get everything and then what?. I would be found in some park committing suicide like Foster? This is standard procedure. In other words, it does not matter if you believe you have Constitutional rights. They mean absolutely NOTHING until you can find a federal judge to agree. Good luck when they appoint former prosecutors as judges. Lavabit has been told that they would face serious criminal sanctions if they publicly discuss what is being done to their company. We do not live is a “free country” any more. Government gets to do as it like whenever. America cannot survive when it turns against its own people. This is indicative and right on time regarding the turn in the 224 Year Cycle for the United States – virtually to the month. This is the typical reaction that always takes place in the end times for every empire, nation, and city state in history. Google, Facebook, Microsoft, Yahoo, Apple, and the rest of these internet titans have sold out more than their companies. They have defiled the American Dream, what so many generation have fought and died for. How can we tell our kids to go to war and risk their lives for our way of life? The Constitution means nothing. There is nothing left. Those who think you can buy gold coins to survive had better realize that unless you are paying cash where there are no surveillance cameras, chances are they know you have the gold and view that as someone who disagrees with their power. It is beyond the point of no return. We are either a free nation or a subservient one. If terrorism is that severe, close up shop and stop meddling in the world’s politics and they will also leave us alone. That is a better alternative to giving up everything to gain nothing. Lavabit has taken an impressive stand against the US government, sacrificing its own self-interest for the privacy rights of its users. No greater noble act can ever emanate from the depths of Washington.